Richard Greene is a staff writer with Samaritan’s Purse. Recently, he traveled to South Sudan to cover our work there with refugees and internally displaced people. I can’t tell you how many times I embarrassed my two daughters during their young lives by yelling out “bravo” when they were publicly recognized for various athletic or academic achievements. They would gasp and roll their eyes each time they heard my bellicose cheering from the grandstands on their behalf. So when it came time for them to graduate from high school and then college, they both made me promise that I would not shout out “bravo” when they walked across the stage to receive their diplomas. That would be mortifying! Oh, it was so hard to bite my tongue because I was one proud papa, but I kept my promise to them. In March, I had the privilege of witnessing a different kind of graduation. It took place while I was visiting South Sudan to see how God is using Samaritan’s Purse throughout this troubled nation. Eman, the 2-year-old daughter of Nasirin, was “graduating” out of our nutrition program—meaning she was no longer considered malnourished. Nasirin was one elated mommy when told that Eman no longer needed to come to one of our five nutrition centers in the Yida Refugee Camp—as she had been doing since January when her daughter was first diagnosed as moderately malnourished. “I’m so happy,” Nasirin told me as a huge smile lit up her face. Instead of shouting “bravo,” I instead declared, “Praise God.” What a touching ministry success story—victory in the midst of adversity. Samaritan’s Purse has trained about 150 community nutrition volunteers who fan out throughout the Yida Camp to identify children under the age of 5 who are considered malnourished. They visit mothers in their homes and, while there, they measure their children’s upper arms, which provide an excellent indicator of the child’s nutritional health. After this initial screening, the volunteers encourage the mothers to take their children to the nearest nutrition center. During the entire time the children are enrolled, the volunteers follow up with the mothers to make sure they’re sticking to the dietary food supplement schedule, as well as following proper hygiene measures. 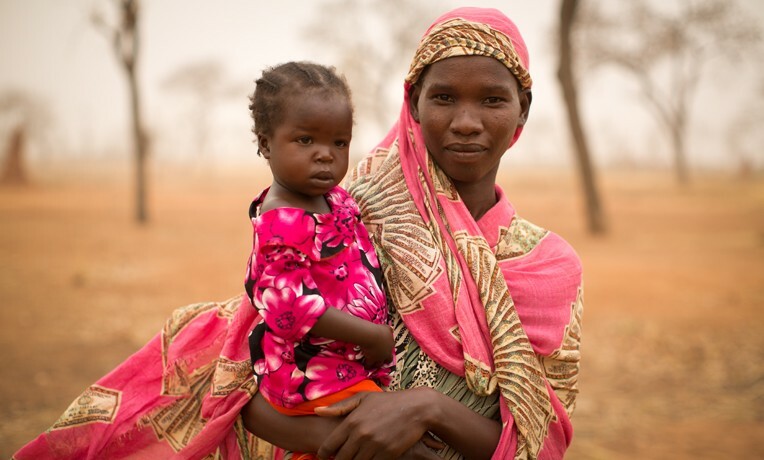 “My daughter was very thin when I brought her to the nutrition center, and I was worried about her,” Nasirin said. “When I heard the center was run by Samaritan’s Purse, I believed my child would be OK.
Over the next 90 days, Nasirin saw improvement in Eman’s condition. And when she arrived on March 15, she received the good news of Eman’s graduation. Stella Edong, our nutrition program manager for Yida, praised Nasirin as a model parent. The morning I met Nasirin and Eman, I also met Urshin, one of our community nutrition volunteers. I was inspired by her commitment, her passion, and her service. Urshin came to Yida in 2011, when bombing of her village in the Nuba Mountains forced her to flee to South Sudan. She’s been serving as a volunteer for the past four years. Her motivation was simple yet powerful. Taking it one major step further, Urshin said that she believes it’s God’s will for her to serve the community.